Cleavon Little plays an escaped black convict who ends up being given the poison chalice job of the new Rockridge Sheriff by scheming railroad developer and politician Hedley LaMarr (Harvey Korman). 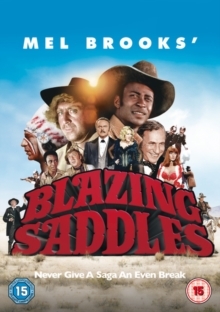 Notionally sent in to protect the ungrateful Rockridge community from marauding gangs, his only ally turns out to be alcoholic former gunslinger The Waco Kid (Gene Wilder). Though initially expressing racial prejudice the townsfolk eventually adopt the Sheriff to help them outwit Hedley LaMarr, deciding to construct an exact replica of their town to fool the invading posse. The film descends into postmodern chaos as the action spills out of the film set into wider Hollywood.